Gov. Rick Perry says he's declined an offer to greet President Barack Obama when he arrives in the Texas capital on Wednesday. Instead, the Republican says he'd like a "substantive meeting" with the president on the immigration crisis. 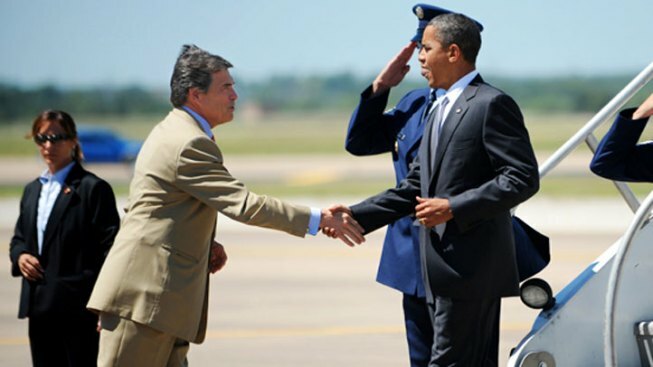 In a letter to the White House on Monday, Perry turned down what he called "a quick handshake on the tarmac." But Perry said he'd be willing to rearrange his schedule to discuss "the humanitarian and national security crises" on the Texas-Mexico border. Obama will be in Dallas and Austin Wednesday and Thursday, raising money for Democratic causes and speaking about the economy. Perry has previously invited Obama to the border while sharply criticizing his administration amid a surge of unaccompanied children and families, mostly from Central America, pouring into the U.S.